Back in the summer of 2013, Santa Monica Studios Creative Director, Cory Barlog, had the insurmountable task of starting work on the latest iteration of the beloved God of War series. This was a franchise that helped define the PlayStation 2, some 15 years ago. When this newest version was first shown off at E3 in 2016, it once again showed that the series lead, Kratos, would once again be prepared to spill blood; but in a whole new land, with new challenges that would await him. This latest God of War brings with it not just a new setting, but entirely new gameplay mechanics and combat systems that are fresh and new to the series, yet, despite these considerable changes, God of War feels comfortably familiar, and incredibly satisfying. This is not only the best in the series but is currently one of the best games on the PlayStation 4. There is no mistaking it, this new God of War is different in almost every conceivable way from its predecessors. Gone is the Kratos of past and while there are several moments of once again witnessing his spartan rage and fury, the former God of War has calmed down considerably from the last time we saw him. This change is due in large part to his once again being a father. While the game starts out with him mourning his recently departed wife, he is now fully responsible for the well-being, and training, of his son, Atreus. Before I dive too far into this review, be warned I will be discussing several aspects of the game that could be considered spoilers. I will be putting up spoiler warnings, but I won't be dishing out on any of the dramatic reveals or elements crucial to the story, but I will be going over certain weapons you will be using during the game, a few of the locations you will visit, as well as certain characters that will join you on your adventure. As much as I would love to remain vague about these parts of the game, they help flesh out my opinion on the overall experience. Be rest assured, however; that God of War is a masterpiece and if you don't want a single thing spoiled about the game, then leave this review now and simply just go buy it. What Barlog and his team have achieved here is something truly wonderful, and for those that want to carry on, then let's do this. One of the underlying themes in this latest God of War is one of relationships, both parental and otherwise. You have the family dynamic between Kratos, his wife Faye, and their son, Atreus, to the Dwarven brothers who outfit you with gear and various trinkets. Nearly every character you encounter has some sort of relationship trouble with a family member or at the very least some emotional connection to what Kratos and Atreus are going through. When you begin the adventure it is very clear that Kratos wasn't around to raise his son; often instead out hunting and gathering for his family. The two are estranged at the start but Atreus is very eager, sometimes too much so, to prove he is a man in the eyes of his father, a man he literally does not know. There are moments where Kratos will reach for his son's shoulder to comfort him, only to have his hand freeze up, unsure of how to show his emotional support. It is these moments, not just with Kratos and his son, but to each of the relationships on this journey that truly set it apart from any game currently on the market. For years, Kratos had made it his living of being a monster, an uncontrollable killing machine of pure rage and anger. His blood-soaked past was left behind him, but the scars, both physically and mentally are still with him. This past is something he has kept from Atreus, something he wants the boy to never know. The fact that he is a god also indicates that Atreus too is one as well, a truth he considers a terrible burden. Wanting Atreus to be ready for what may come his way is something that weighs heavily on the older Spartan's mind. Whether it is the boy's rash impulse to charge into danger or his own temper, Kratos walks an emotional minefield of caution when trying to teach the boy how to stay focused, disciplined, and calm. Kratos has made several mistakes in his life and he only wants the boy to be better than he ever was, a fact he repeats consistently to the young Atreus. The story is centered around spreading the ashes of Atreus' mother at the highest peak in all the realms. It is a journey that is visually shown to you as the peak of said mountain is far away in the distance. God of War uses a single camera frame to tell its story, rather than cutting away to load a new area or anything that would resemble a typical loading screen. While there are a few moments where the game will cut to a pure white screen, these flashes hardly last more than a few seconds and are almost entirely reserved for its fast travel system. The game still uses the typical bottlenecking that will slow down your character to perform a series of animations that allow the game to load ahead of you like crawling under a low entryway or lifting a large rock to clear the path, but apart from dying or reloading your game, there is never a static screen used to load the game. This single frame allows the story moments to appear far more immersive than they normally would be. The camera will leave the side of Kratos to focus on a giant creature ahead of you or when it takes to the sky to show you something massive. The framing used in God of War is fantastic and this method of how the story is told in one shot shouldn't be understated. It is a very cool trick that Santa Monica Studios does extremely well. 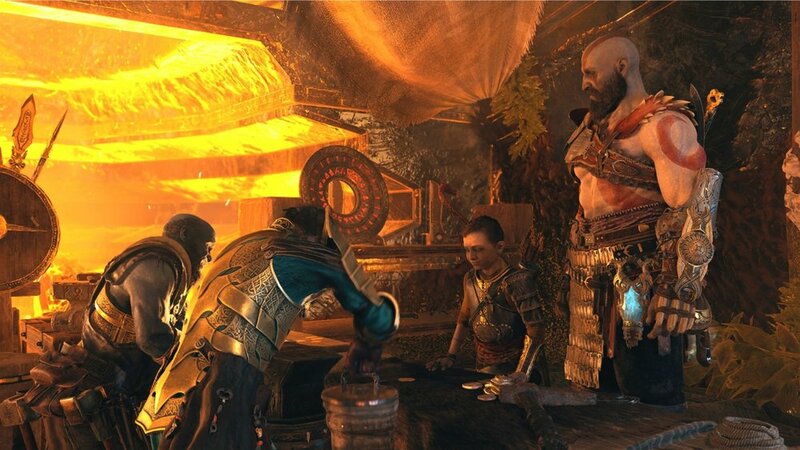 While much of the focus is on strengthening the bond between Kratos and Atreus, there is a wide assortment of supporting characters that not only feature some stellar writing but some memorable performances as well. The Witch of the Woods is wonderfully used and becomes a central figure in the story due to the ways in which she is able to assist both Kratos and Atreus. The fiction set around her is great, and the subtle changes in her expressions are wonderful. The Huldra Brothers, Sindri, and Brok, are two of the best supporting characters ever produced. The strained relationship between the two, the very duo that fashioned the mighty Mjolnir, is constantly referenced and the personalities given to the two are both hilarious and addicting. I would often press the dialogue button to just hear the topics of conversations each of them had and looked forward to each new interaction between the foul-mouthed Brok, or the squeamish Sindri. While there are several other characters that take up a moment or two of your time, one of the best is Mimir, the Norse God of Knowledge and Wisdom. You will meet him a few hours in and his contribution to the story is fairly substantial as he will illustrate much of the lore and experience you have here. His wit and charm are immediately noticeable and the way he interacts with both characters is extremely well conceived and the way in which he is implemented into the story is something I really didn't see coming. There is, of course, the villain, but that is a character I won't be getting into detail here. While the game is centered around the likes of Odin, Thor, and those that are connected to them, much of the pantheon of Norse Mythology is not featured here, but probably reserved for the sequel. That's not to say that some of the bigger threats don't make an appearance, but much of what is shown here is the lesser known names of this age. I do wish the central threat Kratos faced was shown a bit more to flesh out his motives, but the twists centered around him and Kratos are well done and what is done here feels like a natural way to leave the Greek mythology behind. The world of Midgard is beautiful, and if you are aware of Norse Mythology, then you know full well that there are nine realms to explore; however, several of them are blocked off due to certain story elements that make traveling to them impossible, at least for now. You will explore several of the nine realms during your time with God of War. I put in around 22 hours to complete the main story with another 10-12 used to wrap up some side quests, Valkyrie battles, and tracking down the numerous armor sets and upgrades you can bestow upon both Kratos and Atreus. That being said, I still have at least another 10-15 hours left until I'm pretty much done everything. Much of the exploration here is similar to games like Metroid or the recent Tomb Rader games in which several areas are blocked off until you are equipped with the proper item used to access them. What is so impressive about the environments here are how layered they are even despite not having the right tool at the time. I've come across dozens of examples in the game where I could see something just out of reach and then stumbled upon it several minutes later by taking a completely different path than what I would have assumed reached it. Kratos can scale the side of walls that are highlighted with special markings and much of the exploration isn't just used to get from point A to point B. There are numerous puzzles that require you to hit special Norse stones or use special crystals to trigger paths of light that bridge the gap needed to traverse to an out of reach platform. There are also special stones that require the use of a weapon to carry power from one to the next that not only assists in certain elements of the story but solving some previously locked areas as well. 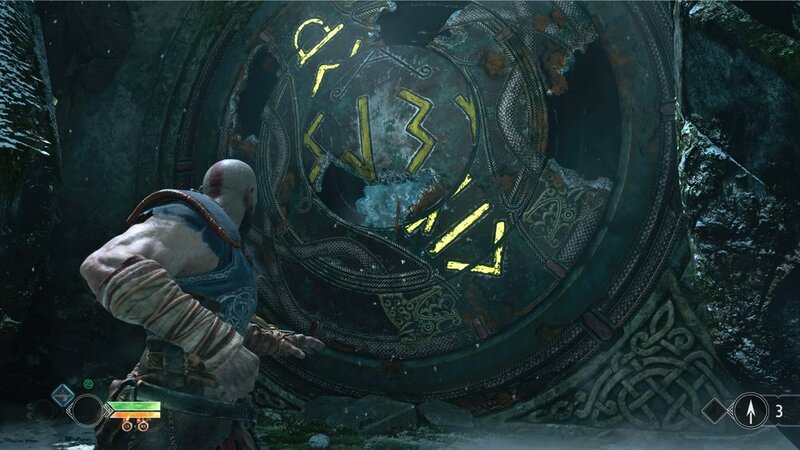 The variety in God of War's puzzles is wonderfully cryptic without coming off as impossible. There were several puzzles that I would come across that would stump me for hours and then it would suddenly click when I encountered an item needed to solve them or another puzzle that had similar traits. When you first get in the boat to sail around Midgard, you'll be limited in where you can explore, but as soon as you start to progress in the story, the areas continue to offer more and more to explore and discover. There are even locations in the starting area that continue to give much later on in the campaign like using a special item to break down sealed doors; several of which you will see before you even know how to deal with them. What is so impressive about the level design here is that even revisiting previous areas a third or fourth time will almost always offer something new that you either missed or just didn't have the item required to fully explore it. What also stands out with the realms offered here are just how visually distinct they are. While Midgard has been shown several times during the trailers, reveals, and various promotional materials, the remaining realms have yet to be shown off to any large degree. I won't dive into all of the realms you will visit, but just a few to indicate what they can offer you. During the story you will visit Alfheim and Helheim, two locations that while not nearly as large as Midgard, are featured fairly heavily into the story. Alfheim is the realm of the Elves and is visually one of my favorite areas in the game. Helheim is a much smaller environment but offers some fantastic action moments in the story. Another location that is present but not part of the main story is Niflheim and this location acts as a post-game environment by offering a randomized arena to work towards earning some high-end gear. During your adventure, you can outfit Kratos with numerous armor sets, relics, and a talisman. You can equip chest, wrist, and waist armor and upgrade each piece to hold numerous relics; items that grant additional perks and buffs. There are numerous sets that work towards increasing certain skills like strength, defense, vitality, runic power, and your special attack cooldowns. While it is entirely possible to outfit your Kratos on pure looks alone, the harder difficulties will make it essential to apply certain pieces in order to just survive. While you may find certain pieces out and about in the wild, the majority of your armor will have to be crafted via special items and currency that you'll find in chests or on the bodies of the dead. The crafting system is somewhat basic but easily gets the job done without feeling like a last minute addition to development. Working towards a certain piece of armor became an addiction, and it kept me playing long after I completed the story to secure that much sought after item. While there are only a few visually distinct sets, they are very different from one another and I kept mixing and matching my full set to benefit from different stat boosts. Kratos will have access to three different weapons during the course of the game. I mentioned before that I would be talking about each of the weapons featured here, so let's continue. Kratos will start the game off with the Leviathan Axe, another weapon constructed by the Huldra Brothers. This axe handles similar to Thor's Hammer in the Marvel Cinematic Universe. You can hurl it across the environment and then have it fly back to your hand in a split second. This can allow you to throw your axe and have it remain in an enemy while you dish out some punches or shield attacks to another foe. You can also recall the axe and have the backswing hit targets on the way back. This opens up for some interesting combinations of attacks as you toss and recall in order to put down your opposition. The first real boss encounter has the villain dodge your incoming swing, but it is when you recall the axe back to your hand that you can catch him unaware and leave him vulnerable for a few precious seconds. The Leviathan is a wonderful addition to the weapons that Kratos has held over the course of the past 15 years. Speaking of his past, the Blades of Chaos make their return. While that may come as somewhat of a shock, It just wouldn't have been a God of War game without his signature blades. You'll unlock them several hours into the game and when you swap between them and the axe in mid-combo, the action can get extremely intense. While some gamers were cautious about the speed of the game given the gameplay shown via the Leviathan Axe, you can rest assured that the speed of the game is just as fast, if not faster, than what you've experienced before. The Blades feel incredibly fun with the new camera angle and frankly, I vastly prefer the use of the blades here than any of the previous games. While the combat can very fluid and lead to some extremely brutal execution kills among all the axe swinging and blade slashing, you can also unequip your weapons and take on enemies with just your fists, and in some cases, this can lead to doing more damage. The problem I have is that I wish unequipping your weapons was a long press on the D-pad and not just tapping the D-pad as this has lead to me taking damage while I would attempt to select my weapons. I also wish the axe could be triggered to automatically come back to you as I've died to numerous Valkryies because I had to spend a few seconds having my axe find its way back to me. The combat is terrific, don't get me wrong, but there are some annoyances that can make for a less than stellar experience. Each weapon can be fitted with two runes and a pommel; a fixture at the end of the handle. The pommel upgrades will change the look of the handle, possibly increase what level it is, and offer up a small perk as well. As you increase the level of the weapon, you will unlock new skills to use across the Leviathan and the Blades of Chaos. The Leviathan is granted the ability to freeze pretty much anything it touches and runic attacks like 'Fury of the Ice Troll' allow you to deal an AOE ring of frost at large groups of enemies, or a heavy attack called the 'Frost Giant's Frenzy' that has Kratos hitting the ground in quick succession causing explosions of frost to topple his foes. It is a devastating weapon for sure and one that matches all the rage and fury that Kratos can muster. The Blades share in their destruction with numerous runic attacks that have you swing the firey blades around to deal some intense crowd control with the 'Cyclone of Chaos', or the 'Fire of Ares' that has Kratos stab at the ground and cause a fire attack to engulf a straight line in front of him. Each of these runes can be upgraded to enhance certain aspects of the attack. As you fight and earn experience, you will spend it on upgrading skills within each weapon class. These skills range from granting attacks while sprinting, additional combo moves, to increasing the elemental damage of your weapons. You will easily earn enough experience to unlock each and every skill, so you never feel like you are being cornered into making certain builds. Each weapon can also see core upgrades made to them as well and each upgrade will change the look of the weapon much like swapping the pommel out to add that nice little bit of flare. The final weapon that Kratos has access to is Atreus himself. The boy can climb on top of enemies and choke them out or cause additional stun damage that will eventually cause the enemy to become stunned and fall victim to a brutal execution kill on behalf of the God of War himself. Atreus can also be requested to fire arrows at any enemy you target and while his quiver will never empty, he is limited to only so many arrows before he needs to recharge his attack. These attacks become far more important and reliant the stronger and more capable Atreus gets. It is truly a work of art when you are swapping between runic attacks with each weapon as you slam down the arrow button and watch each enemy around you fall in seconds due to the co-op nature of father and son. Atreus can also equip a runic summon to his bow that allows him to summon a murder of crows, a stampede of wild boars, and more. The progression system can come off a bit confusing as it borrows some of the aspects of Destiny where the overall level of several pieces of your armor and weapons will dictate your core level. Increasing your level is incredibly important as each enemy will have a certain level attached to their health bar so it can make it a bit easier to know exactly the power of what you are up against. The enemies range in all shapes and sizes and most of what you will encounter will be variations on about a dozen or so different types of enemies. These will range from the undead warriors called the Draugr, to the large and towering Soul Eater, a stone creature that can fire intense blasts from its chest. The various enemies will more or less match their realm, so you'll also encounter Dark Elves, Hel-Revenant's, Rabid Wolves, and far more. God of War is quite possibly the best looking game currently on the PS4. While I still find that certain aspects of Horizon Zero Dawn or Hellblade can give it a run for its money, there is no mistaking that God of War is a visual masterpiece. The detail on Kratos' armor, or the subtle details in the environment offer some insanely gorgeous textures that look remarkably good no matter running in performance mode or resolution mode on the PS4 Pro. The game looks fantastic no matter the hardware, but the framerate itself did hold up better running in performance mode at 1080p. I did switch to resolution mode for that added bump of detail, but noticed some slight framerate dips during some intense action or during exploring some of the more detailed environments. I also recommend turning on 3D if your TV has such a mode as the depth to the environments is really impressive and can add even further to the scope of what God of War can offer. The voice talent here is impressive, and while TC Carson is not back as Kratos, Stargate SG1's Christopher Judge excels as the older Spartan. In all honesty, I don't think Carson's take would have worked here as it lacks the depth of what this new God of War expects from Kratos. The subtle grunts and changes in his tone, makes Judge the perfect voice for Kratos. The variations of him saying 'Boy!' is also a true highlight of the game and always left a smile on my face. Sunny Suljic, whose acting credits contain 'The Killing of a Sacred Deer' and the upcoming 'The House with a Clock in Its Walls' nails everything you want from the young Atreus. His interactions with Judge feel natural and his curiosity about what is going on, not to mention when he is trying to teach Kratos about the world, is believable and performed beautifully. Every voice in this game, especially that of the Huldra Brothers is simply some of the best I've heard in some time. I also found it really cool that when you are traveling in areas that you would expect there to be an echo that the voices would be altered to support that very echo. God of War had a lot of expectations going into it. Many people expressed their concerns that it was too different from what had come before that the very identity of the series was under attack. While yes, this newest version does stray the path in some vast ways, but the heart and soul of God of War is here in every frame of animation, every moment Kratos screams in rage, or every time his axe splits an enemy in two. The series has always been about family, and while it may not have had the story told in the same ways, this theme is present from the very start of the series. God of War is a franchise that deserves to evolve and grow in the same ways us gamers have since the very first game. Barlog and his team have crafted a wonderful journey that has just as much bloodshed and chaos as it does heart. The combat, the story, the sheer scope of what is offered here is stunning and everything this game offers is a true work of art. god of war WAS PURCHASED BY THE REVIEWER. all screenshots were taken on a ps4 pro. The following trailer may contain some spoilers, so be cautious when viewing.